If you are booking for more than 10 persons…. As we buy fresh ingredients every day from the market, we need to know which dishes you want for your menu, not later than 3 days before your reservation. You can send us your complete menu to: info@brewpub.dk or phone +45 33320060. If you wish to book for more than 20 persons, please contact us by e-mail: info@brewpub.dk or phone +45 33320060. A guided tour of the brewery including a beer tasting (4 x 10 cl. beer) for minimum 10 persons. 145 DKK per person. Please note: Minimum 10 persons. 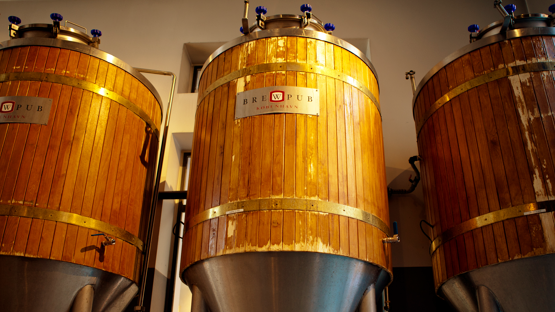 If you would like a Brewery Tour (with beer tasting) in combination with a table reservation for at least 10 persons, please send us a request by email: info@brewpub.dk or phone +45 33320060. The tour costs 115 DKK when taken with a meal. Please note: It is not possible to reserve a table in the bar areas.